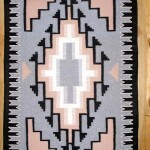 This Indian rug resembles the classic Crystal or Chinle Navajo rug. 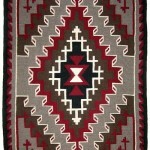 Crystal initially emerged as a regional style and center during the Rug Period 1890-1920. 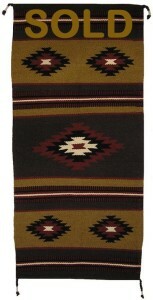 The typical contemporary Crystal is banded not bordered, featuring vegetal-dyed yarns in warm golds, browns, greens, and a touch of black. 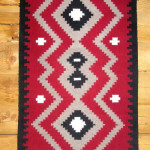 The Chinle rug style appeared during the Revival Period 1920-1940, and is distinctively reminiscent of the old borderless Navajo blankets. 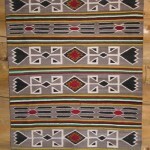 The Chinle weaver combines subtle vegetal dyes with a few chemical dyes, and some darker color in the patterns. 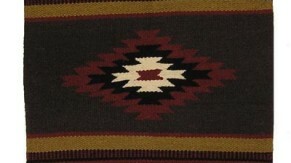 Chinle rugs are banded, and usually woven in browns and golds, along with natural wools in whites and grays. 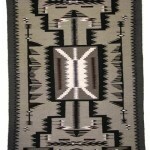 The traditional Chinle style is a simplified version of stripes and bands enhanced with a serrated diamond motif.